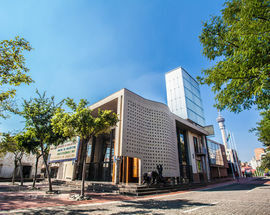 South Africa's Constitutional Court, located at the Constitution Hill complex in Braamfontein, was officially opened on March 21 (Human Rights Day) in 2004. The court's main function is to uphold the principles enshrined in South Africa's constitution, making this the highest court in the country. 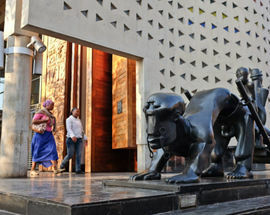 A must-see, the building's design and the artworks within it reflect the values of the constitution such as transparency, equality and the protection of human rights, while also reminding visitors of South Africa's struggle history. The best way to learn more about the building's rich symbolism is on a guided tour which can be arranged through the Constitution Hill ticket office. Constitution Hill, now home to one of South Africa's best museums, was once one of Joburg's most notorious prisons. During the apartheid-era hundreds of political prisoners and ordinary criminals were held here and the prison was only shut as recently as 1983. The area's terrible history was a key factor in the decision to build the court there, as Justice Albie Sachs explained: "This wasn’t just a neutral space – this was a space of intense drama, of human emotion, of repression, of resistance. And here was the chance to convert negativity into positivity.” The Constitutional Court building was actually constructed on the site of the old Awaiting Trial block. – The old Awaiting Trial Block was demolished to make way for the new building but its bricks were saved and used in the construction of the new court. Just four stairwells from the old block remain; two in front of the court (where the eternal flame of democracy burns) and two have been incorporated into the building itself, a permanent reminder of the horrors of South Africa's history. – One of the building's most enduring architectural themes is the idea of 'justice under a tree', a reference to the African tradition of transparent community meetings. This theme is reflected in the foyer where wire chandeliers resemble a leafy canopy and mosaic pillars remind one of tree trunks and branches, as well as in the building's carpets, the designs of which resemble the dappled sunlight beneath a tree. – The court chamber is set slightly below ground and its walls are inset with a panel of narrow windows that allow the legs and feet of passersby to be seen, a reminder of the court's transparency and impartial judgement. – The massive carved wooden doors at the building's entrance display the 27 human rights. These fundamental rights are carved in 11 official South African languages as well as depicted in sign language and braille. 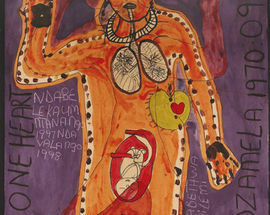 The initial budget for the Constitutional Court decor was a mere R10,000, the entirety of which was spent on the court's first artwork, a tapestry by Joseph Ndlovu titled Humanity. 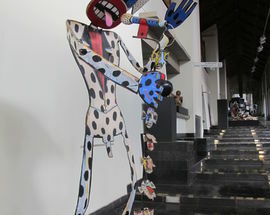 The majority of the Constitutional Court's extensive and continually growing art collection was donated by the artists themselves. – The Man Who Sang and the Woman Who Kept Silent by Judith Mason. Often referred to as the “Blue Dress”, this is one of the collection's most powerful works. 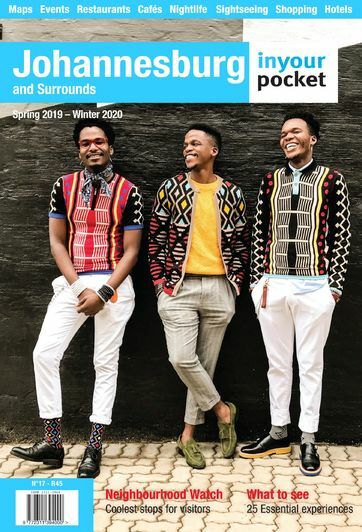 The triptych was inspired by the execution of two liberation movement cadres by the security police – Phila Ndwandwe and Harald Sefola, whose deaths during the struggle were described at the Truth and Reconciliation Commission (TRC) by their killers. – Prison Sentences by ​Willem Boshoff. These eight slabs are made from Zimbabwean black granite and inscribed with the tally of days served behind bars by the Rivonia trialists who were sentenced to life in prison in 1964. – Nine Body Maps. 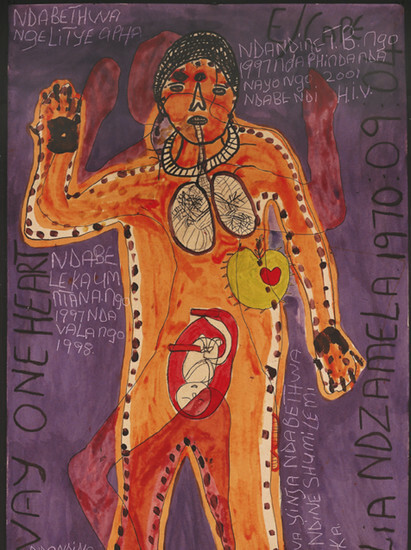 This series of intimate self-portraits is the result of a community art project that gave those suffering from HIV and AIDS a platform to express their experiences of living with the disease. 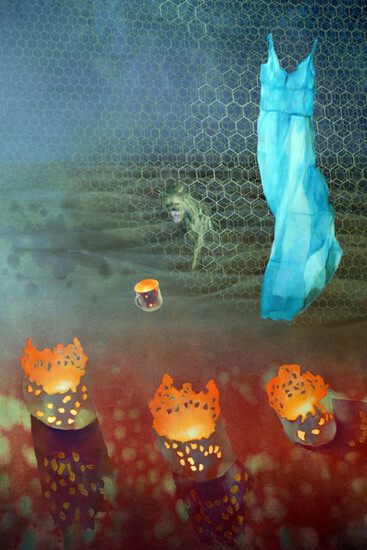 – The Three Sentinels. Standing outside the building at three different corners are three sculptures referred to as 'the three sentinels'. 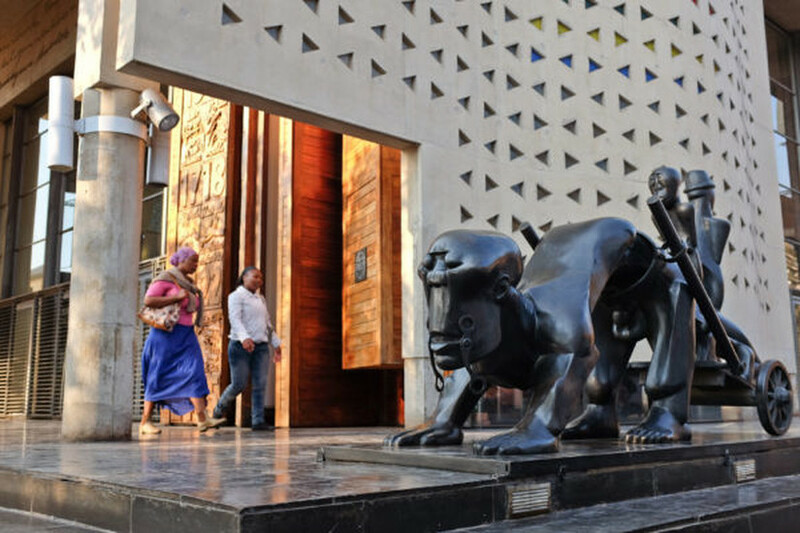 Adjacent to the building's main entrance is History by Dumile Feni, a large bronze sculpture (based on a smaller clay artwork from 1987) that reminds visitors of the brutality of the master-slave relationship. – The South African flag. 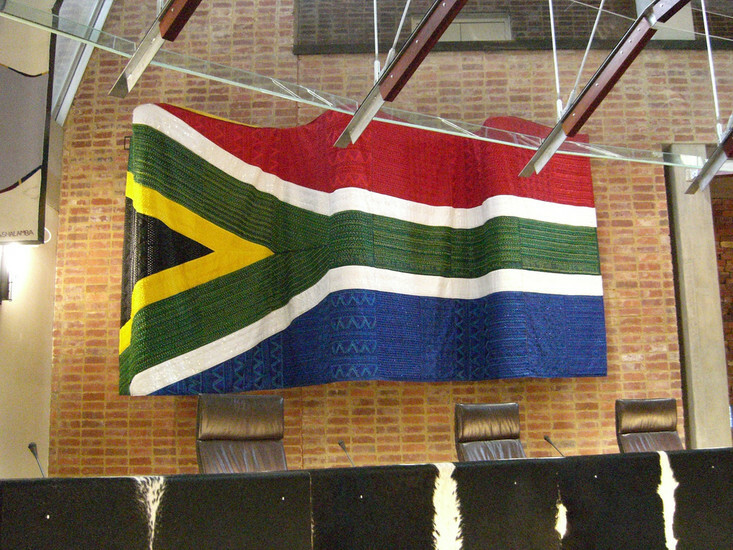 One of the most impressive features of the court chamber is the 6m by 2.5m intricately beaded and embroidered South African flag. 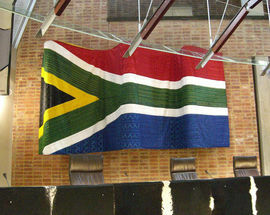 The flag was hand-stitched over a period of six months by a group of women from KwaZulu-Natal. On completion of the work their names were also embroidered onto the flag in recognition of indigenous craftsmanship as a form of art. 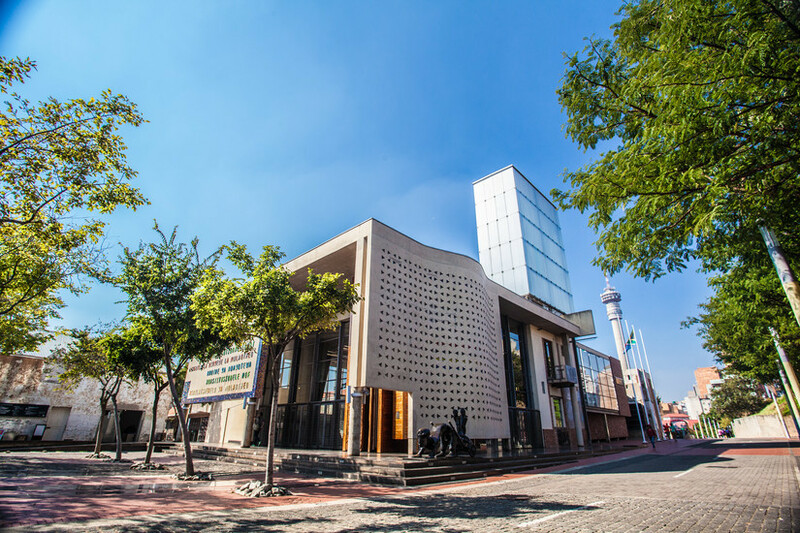 Constitution Hill is located at cnr Joubert St and Kotze St, Braamfontein, tel. 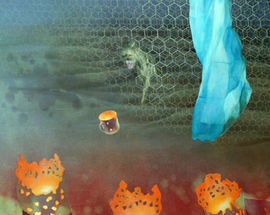 +27 11 381 3100, constitutionhill.org.za. There is guarded parking available inside the complex and the open-top City Sightseeing bus stops right in front of the court building. Constitution Hill is open daily 09:00–17:00. Entrance to all the museum areas costs R65, kids, students R30, pensioners R45. This includes a one hour guided tour of the complex, a two hour guided costs an extra R20. Note that Constitution Hill is closed on Good Friday (April 14). 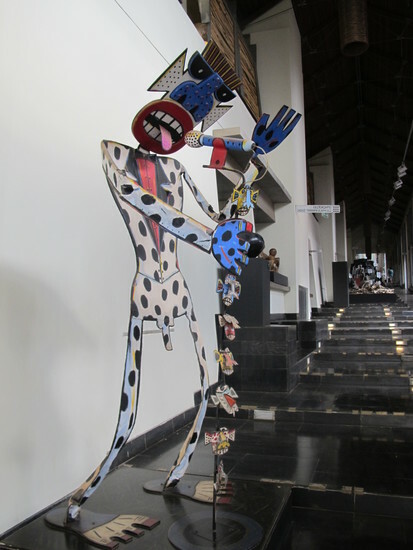 It is also possible to book a special Art and Justice tour of the Constitutional Court.